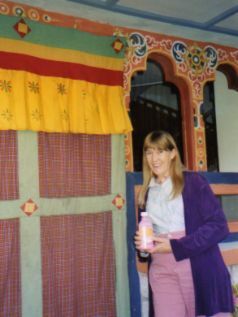 How do Taktshang Goemba (Tiger's Nest Monastery), that emblematic image of Bhutan, and the pink stuff go together? Well, even for a day hike, you want to feel in the pink. 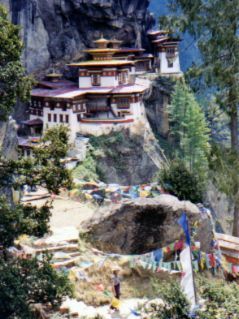 It's a steep hike from 2280 meters (7,480 feet) at the parking lot in the Paro Valley up the mountain to the 3180 meter (10,435 foot) level where you can see, or if you're lucky, visit Tiger's Nest. But if you have a sudden attack of travelers' diarrhea, it'll probably be the bushes for you. For a glimpse at some sights in Bhutan...... and for some sounds.... like monks chanting, prayer wheels ringing... watch our amateur video... We wanted you to know that we did more than clown around. It all started when we entered a contest for the pink stuff. We took photos all along the way on this trip. It was fun... and funny... but no, we didn't win the contest! 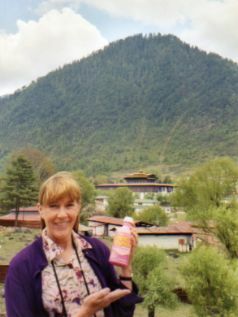 Apologies to my Bhutanese friends.... but it does give me another opportunity to tell you how much we rely on our favorite pink drink (or tablets with the new security rules on liquids). 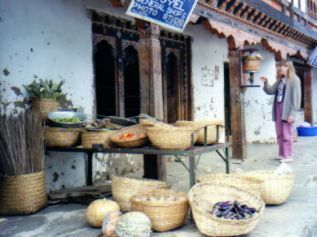 It takes more than the spin of a prayer wheel to stay healthy even though the food in the vegetable markets looks great. All the standard caveats apply about eating and drinking for travel health, but Pepto-Bismol will make the difference... at least it has for us. The veges ARE great, but there are the sauces, the yak butter, the yak cheese, the CHILIES!!!! Fern tips in chili and cheese sauce, yak meat with chilies, potatoes with yak cheese and chilies. There's the Red Panda Wheat Beer. And of course, if offered, you must drink yak butter tea accompanied with popped rice and barley. Oh, yea, we were definitely "drinking pink". We took an excursion through the Haa Valley. The night before, we had dinner with some local friends. They assured us they had gone light on the chilies, but that dinner had Mark taking extra swigs of the pink stuff. In another bit of silliness on that winding drive to Haa, Mark started singing, "Ha, Ha, Ha, Ha, staying alive, staying alive". (He needs to apologize to the BGs for that one!) I apologize for the quality of our video, but it does help get a feel for how you can have fun with anything, doesn't it? All the local teens joined us in that refrain, and that had us all laughing! Let me tell you though, sometimes it's just how Pepto-Bismol makes you feel..... staying alive. 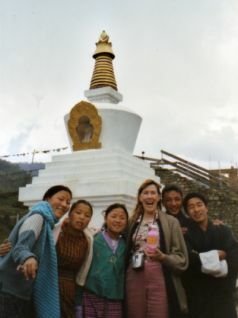 We have fun interacting with the locals... as our silliness shows just as it did in China. And we never hesitate to accept a cup of tea in someone's house.... It makes travel more personal and meaningful.... and with Pepto-Bismol, we don't have to worry so much about staying healthy!